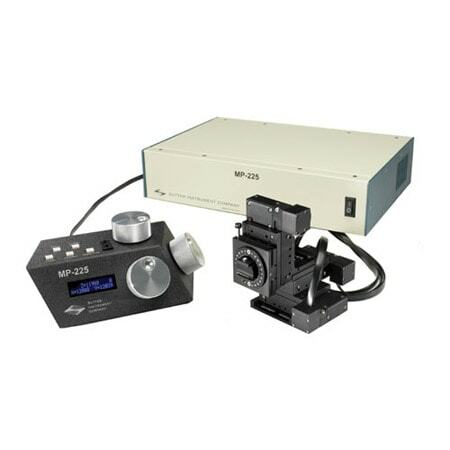 The MP-225 is one of the newer members in the Sutter Instrument Company micromanipulator line. Production and design changes have allowed us to produce a motorized manipulator that is a more affordable alternative to the industry standard MP-285. While the MP-225 feature set is less comprehensive than the MP-285, it includes the most popular features with a user interface that is simpler to use. The mechanical design utilizes a miniature stepper motor and integral anti-backlash gear head. Pre-loaded ball bearing slides provide smooth movement throughout the 25mm of travel. The controller uses low-noise, linear-drive output circuitry identical to that found in the MP-285. The methodology for mounting pipette holders and headstages used with the MP-285 has been maintained in the MP-225 to allow for cross compatibility. The MP-225 is designed primarily for positioning patch and intracellular recording pipettes. We have retained and refined the features most desired for this type of work. An extended version of the popular rotary optical encoder (ROE) is the sole input device available with the MP-225. Like the MP-285, the manipulator has a synthetic 4th axis for diagonal advancement of the pipette; 16 different angles are selectable via DIP switches. Speed and resolution of movement are easily selected with a multiple position thumbwheel, allowing fast/course movement and slow/ultra-fine movement in 10 increments. Two commonly used robotic movements have been incorporated for user convenience. A single button press can initiate a move to a Home position for pipette exchange or to a user defined Work position for quick location of the pipette near the recording location. A display on the ROE gives position location. As all controls are located on the ROE, the controller can be moved to a less accessible area of your setup and does not need to occupy prime space in an equipment rack. As always, our technical support team is available to address your particular needs and answer all questions before and after your purchase. Submicron (62.5nm) minimal resolution for fine movement. Convenient thumbwheel selects resolution/speed of movement. 25mm of motorized travel on all three axes. 4th axis for coaxial movement of pipette, angle selected by DIP switches on ROE. ROE button press actuates move to Home position for pipette exchange. ROE button press actuates move to Work position near recording location. Continuous display (in microns) of axes positions located on ROE. DIP switches on ROE select direction of movement produced by turn of ROE knob. Modularized, compact design easily adaptable to your setup. Mounting adapters included with manipulator.